Service item numbers and descriptions used in this catalogue. 12. Tall Hock 13. Grapefruit. 19. Large Old Fashioned Tumbler. 25. not used 26. Liquer Decanter. At Thos. Webb & Sons, a visitors first reaction on arrival at the factory is usually one of surprise  surprise which results from expecting the reception area to be part of a modern office block and finding instead that one has entered Dennis Hall, a Georgian mansion built over 200 years ago, which was once the home of Thomas Webb. Ones thoughts naturally turn to history, to the origin of the name Dennis, the story of the Webb family, the history of glass itself and to the reasons why the manufacture of beautiful crystal glassware should be centred in this country and at Stourbridge in particular. In the fourteenth century, the area on which the glassworks now stands was part of the Kings Forest and Walter de Denys was appointed as a regarder. It seems highly probable that the name Dennis originated from this centuries-old source. One wonders when the first glassware was made on the Dennis estate  unfortunately there are no records, but what we do know for certain is that the site was leased for glassmaking purposes in 1691. A document dated 1738 which is displayed in the showroom refers to two glassmaking units and specifies the annual charge for the lease  the princely sum of £30. The founder of Thos. Webb & Sons entered the glass industry in 1829 and became a partner in the Wordsley glassworks of Webb and Richardsons. In 1833, his father, John Webb, also entered the glass industry in partnership with John Shepherd at the neighbouring White House glassworks, but in 1835 John Webb died and Thomas succeeded to his fathers share in the Shepherd and Webb business. In 1840 Thomas Webb moved to the Platts, Amblecote, very near to the Dennis estate and started Thomas Webbs Glassworks. In 1855 he moved to the present site. Dennis Hall became his home and Dennis Glassworks became a hive of industry in which at least four of his sons eventually became involved. Thomas Webb died in 1869 at the age of 65 and was succeeded by his son, Thomas Wilkes Webb, under whose astute leadership the companys fortunes prospered to such an extent that the name of Thomas Webb became known among connoisseurs of glassware throughout the world. His energy and enterprise knew no bounds and he travelled thousands of miles, not only to secure new business but to bring to Dennis Glassworks some of Europes finest craftsmen. During this period fine crystal and coloured glass was made, including Cameo and Rock Crystal. In 1878 and again in 1889, the exquisite products of Thos. Webb & Sons were on display at the great Paris International Exhibitions where they competed against glassware from many factories and many countries. On each occasion the Grand Prix was awarded to Dennis Glassworks and Thomas Wilkes Webb must have been a proud man indeed to read in the 1878 Exhibitions illustrated catalogue that Messrs. Thomas Webb & Co. of Stourbridge are the best makers of Glass in the world. In recognition of his contribution to these exhibitions, Thomas Webb was made a Chevalier of the Legion of Honour, an award which the French seldom give to a foreigner. He died in 1891 at the early age of 54. Many changes have taken place since the days of the Webb family whose association with Dennis Glassworks ended in 1919 with the death of Walter Wilkes Webb at the age of 75. 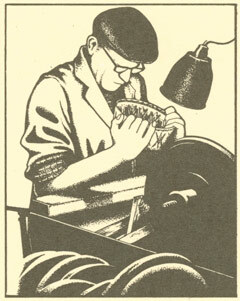 Modern machinery and methods have replaced outdated plant and techniques, but one thing continues to survive  the skill of the craftsman who strives to achieve even higher standards than his predecessors. Crystal Catalogue - 1977 10-11. Molten crystal glass collected from a refractory melting pot by rotation of metal blowpipe. 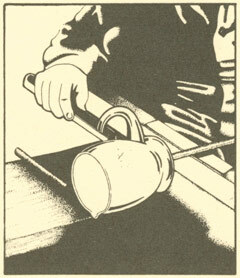 The article becomes hollow and expands as the craftsman increases blowing pressure. A separate piece of molten glass is added and spun with pearwood. Removing surplus glass and levelling the top after welding the foot to a steel rod. Glassmakers tools controlling the shape as the article is spun. A separate piece welded at the base, sheared to length, attached with pincers. Both lead crystal glass and full lead crystal glass are made from a mixture of sand, potash and lead oxide. There is a British Specification (BS 3828: 1964) for each type. Lead crystal glass contains a minimum lead oxide content of 24 %, and is manufactured primarily for its beauty of appearance, particularly when decorated by a skilled glass cutter. Full lead crystal glass contains an even higher proportion of lead oxide, in fact, not less than 30%, which greatly enhances this beauty although it is more costly to produce. The scene presented by the glass-house while the work of glass-making is in progress is full of interest and fascination. Men are engaged in groups around the furnace where the glass is melted, performing, in the glow from the crucibles, the complicated, masterly, and often graceful motions of their craft. Each group is known as a chair and consists of four or five persons: the workman, who is the principal, two who are known as foot-maker and servitor - and one or two boys who are employed in performing minor operations, and carrying finished articles away. A certain part of the work is apportioned to each member of the group, according to the design of the article on which the chair is engaged. To begin, a ball of molten glass is gathered from the pot on the end of the blow-iron, which is a steel tube about four feet long. It is continuously rotated in order to distribute the glass evenly. 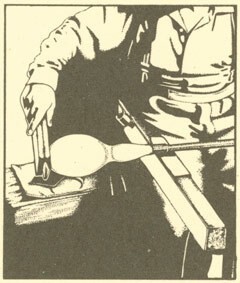 The gathering of glass is next rolled on a polished iron table, called a marver, to smooth and regularise the surface. 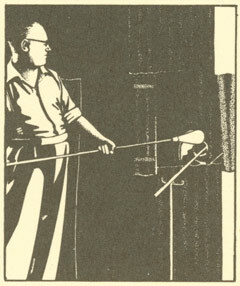 The glass-worker now blows through the tube, and the hot glass becomes a hollow sphere, the blow-iron being turned, tilted and swung in a way which almost magically influences the shape which is developing. 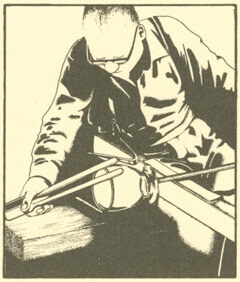 The glass is further shaped as the iron is rolled up and down on the long arms of the glass-makers chair. A few very simple tools are used - such as steel pincers, callipers, shears, wooden measuring-sticks and clappers. The stem and foot is now added, and the object is transferred for further working to a pontil, or steel rod, to the end of which it is attached by a blob of hot glass. 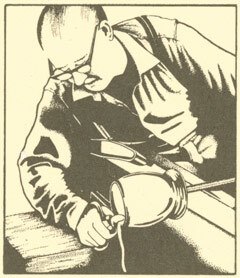 Remelting is necessary before superfluous glass is sheared away from the rim and the final touch given. The still glowing object is cracked off the rod, dropped into a carrying apparatus and transported swiftly to the annealing oven or lehr. The lehr, or annealing chamber, is a long tunnel down which the glass is conveyed slowly, passing gradually from a high temperature to the coolness of the ordinary atmosphere. This is necessary because, if the glass were allowed to cool rapidly, it would probably shatter owing to the strains and stresses within it. On removal from the lehr each article undergoes a searching examination for flaws. At this stage a scientific instrument is brought into play which reveals by means of polarised light any trace of imperfect annealing. Crystal Catalogue - 1977 26-27. Glassmaking was introduced into the Stourbridge district at the beginning of the 17th century by members of old-established glassmaking families - notably those of Henzey, Tyzack and Tyttery - who had come to England from France in the previous century. Usually they had at first established their glassworks in rural areas where there was an ample supply of timber for fuelling their furnaces, but the government of the day was becoming increasingly concerned about the quantity of wood that was being burned in the furnaces and eventually the glassmakers were prohibited from consuming any more - so they had to resort to burning coal. The attraction of the Stourbridge area was the presence of excellent fireclay, suitable for making the crucibles in which glass could be melted, and an ample supply of coal, much of it near the surface. Within a short time, these distinguished glassmakers were joined by others from Italy, bearing such names as Visitellia and Racket. 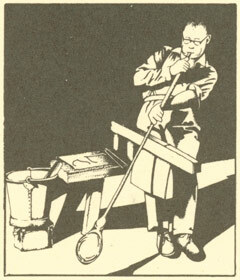 In the second half of the 19th century there was another influx of foreign glass craftsmen, but this time most of them were engravers rather than glassblowers. The most distinguished of these were employed at the Dennis Glassworks of Thomas Webb and Sons. Chief of these newcomers were Bohemians -Frederick Engelbert Kny, William Fritsche and Joseph Palme - who had been reared in their countrys great traditions as engravers, but there was also a Frenchman named Jules Barbe who was an expert in applying enamelled and gilded decoration to glass. It was after seeing some of the work of Barbe at the 1878 Paris Exhibition, that Thomas Wilkes Webb invited him to come to Stourbridge to employ his remarkable technique. In the 1880s he was much engaged in painting in enamels on the Queens Burmese glass which Thomas Webb and Sons were making under licence from the Mount Washington Glass Co. of New Bedford, Massachusetts. F. E. Kny came to Amblecote in the 1860s and was provided with his own workshop at the Dennis Glassworks where he was occupied with engraving and intaglio. The words rock crystal first appeared in Thomas Webbs pattern book in 1879 relating to a table set engraved with animal scenes by Kny. One of his finest works was a crystal glass claret jug engraved with a frieze of Greek horsemen. Known as the Elgin Jug, it was completed in 1873. 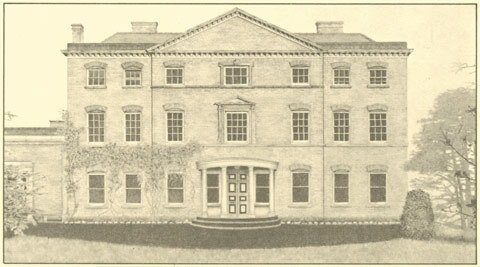 Engraved by Frederick Engelbert Kny. Exhibited at the Paris International Exhibition, 1878. Richly engraved. Exhibited at the Paris International Exhibition, 1878. William Fritsche was also engaged in the production of rock crystal, which owed its name to the effect obtained by polishing engraved and intaglio decoration, and he has been credited with the introduction of this type of decoration at Dennis. Webbs exhibited their first examples of rock crystal at the 1878 Paris Exhibition. In some of Fritsches work the engraving is so deep that it might well be termed glass sculpture. Probably his most famous piece is the Fritsche Ewer which represents the sea, the ornament including a mask of Neptune under the lip, waves and fish on the body and shells on the foot. This is now in an American museum. At the 1878 Paris Exhibition Fritsche had on show a fine pair of vases engraved with peacocks; vases of this type were then offered for sale at £45 a pair. Franz Joseph Palme joined Webbs in 1882 and specialised in engraving animals. Like Fritsche and Kny, he signed much of his work. Among the master craftsmen-artists who carved cameo glass for Thomas Webb and Sons at Amblecote, were the brothers Thomas and George Woodall. Specimens of their work have been eagerly sought by collectors. A vase entitled Aurora, depicting the goddess floating among clouds, signed Geo. Woodall, was sold at Sothebys, London, in June 1974 for £5,200. A similar style of vase known as Mischief, depicting a draped young woman seated on a rock with a cupid whispering in her ear, signed by George Woodall, was sold in July 1975 for £5,800. Designed by Lionel Pearce, was inspired by Shackletons expedition to the North Pole. Made at the Dennis Glassworks, it was shown at the Franco-British Exhibition, 1908. A 16-in. cameo glass vase made at the Dennis Glassworks, c. 1895, and carved by George Woodall. Two of the handsome commemorative glass articles produced in limited editions by Thomas Webb and Sons at the Dennis Glassworks. Crystal Catalogue - 1977 30-31. Glass has been made in the Edinburgh area almost as long as it had been made at Stourbridge. A glassworks at Leith, then an important entreport for the Continent, is mentioned in 1628. Italian glassmakers were induced to move to the Scottish capital from London and undoubtedly, the industry benefited from their expert knowledge and skills. Large quantities of bottles were produced, for which, in 1664, the makers were told not to charge more than 2s. 6d a dozen. A master glassmaker named Robert Pope is mentioned as being at the Citadel works at Leith in 1664, and, early in the 18th century, this works was taken over by the Edinburgh and Leith Glass Co. which extended the business and installed up-to-date plant at nearby premises, producing vast quantities of cut and engraved glass as well as bottles until about 1830. James Rankin established a flint glassworks at Leith in 1773 and over the years other works were opened and closed down. In 1864 the Leith Walk Glassworks was built by J. Thomas who sold it the following year to the firm of Jenkinson which, in 1876, moved to larger premises at Norton Park, Abbey Hill, which had a 12-pot furnace. Two years later, the products of the company were being admired in Paris, the exhibition catalogue commenting their engraved glass had been placed by all critics among the best works of the class that have been sent by Great Britain in competition with the hitherto unrivalled fabrications of Germany and France. They are a credit to Scotland. Jenkinsons continued to specialise in decorated tableware until World War I compelled them to turn to making glassware for war-time use. The dazzling quality of Norton Park glass, whether decorative or useful, rivals that made in the halcyon days of the trade, and so reproductions of antique style are a speciality of this company. Here we have candlesticks, candelabra and s-shaped girandoles alongside the latest patterns of electric lamps. The limpid nature of the glass is charmingly displayed in cut goblets, vases and flower bowls of the most chaste designs, a bewildering display glitteringand sparkling in a thousand lights . . . This company has had lately the honour of supplying Holyrood Palace with an exquisite set of cut glass for the Royal banquets. 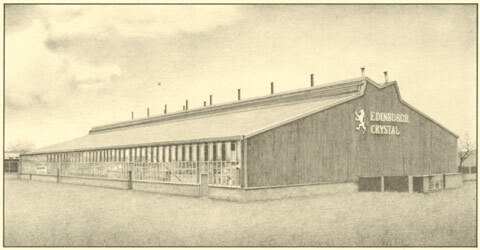 Part of Webbs Crystal Glass Co. since World War I, the Edinburgh and Leith Glassworks retained its title until 1955, when it became the Edinburgh Crystal Glass Co. In 1964 it came under the umbrella of Crown House Limited who financed a complete modernisation scheme. As further expansion and development in the existing premises was impracticable, a new site had to be found and this was located at Penicuik, 10 miles south of Edinburgh. The first stage of the building of the new factory, comprising cutting, polishing and warehouse facilities, was completed in 1969 and officially opened by the then Secretary of State for Scotland, Mr. William Ross. For a time glass was formed in Edinburgh at the old Norton Park Works and transported to Penicuik for decoration. Then, in 1974, an entirely new design of glasshouse was brought into operation at Penicuik and with the completion of the second stage of the scheme, the old glasshouse at Norton Park was demolished after almost a century of use. The factory at Penicuik occupying almost 100,000 sq. ft. is fully operational and accommodates the traditional skills of the crystal glass industry in the most up-to-date manner, incorporating in the process the ideas of both experienced management and skilled craftsmen. The resulting superior conditions are undoubtedly conducive to production of the finest quality and workmanship. Crystal Catalogue - 1977 40-41. This is done by holding the glass against the edge of a revolving wheel precisely in the manner described by the Roman historian, Pliny, with only this difference, that the wheel is turned for the modern cutter by electricity. It sounds a very simple process, but actually it calls for a very high degree of skill. The glass must be cunningly guided to produce some of the lovely and intricate effects that are possible. There is an infinite number of patterns and combinations. Some of these have curious and interesting traditional names such as diamonds, laced diamonds, hobnails, splits, fans, flutes, stars and jewels.The finest of wheels may cut some hundreds of diamonds to the square inch in a pattern of fairy delicacy, or the design may have a massive architectural simplicity and consist of only a few bold cuts and broad facets. 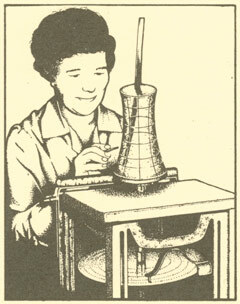 The pattern, which has been indicated on the glass blank by specially trained markers, is first roughly cut on a carborundum wheel fed with water. The next frame carries a synthetic or quarried stone wheel fed with water, which has a much finer abrasive action, and smooths the rough cuts made by the carborundum wheel. The glass is now ready for polishing. Polishing is done by immersing the glass in a vat containing a mixture of hydrofluoric and sulphuric acid. About a minutes contact with these highly corrosive chemicals and a thorough rinse afterwards transforms glasses with matt decoration into sparkling pieces of either Thos. Webb or Edinburgh Crystal. 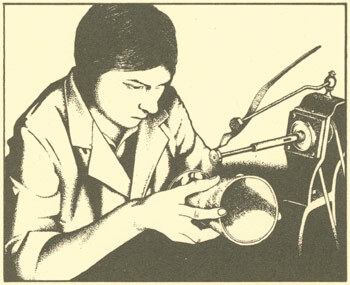 In a modern glass factory engraved designs are produced by various techniques such as sand etching, diamond point and copper wheel engraving. Each of these techniques has a unique quality and it is not unusual to see these processes combined to great effect. Copper wheel engraving is one of the oldest decorating techniques and a long period of training is necessary to develop the skill required to hold a glass against a small revolving copper wheel, moistened with abrasive, to produce an engraved design. Pictorial designs commemorating a public or private event have always been popular. Whether initial letters and a date, or a richly ornamental piece to mark a royal occasion, engraved glass has a special place in the history of fine glassmaking. A goblet made in a limited edition to commemorate the American Bi-centenary in 1976. A goblet made in a limited edition to commemorate The Queens Silver Jubilee in 1977. It is quite normal for people to wonder why small irregularities cannot be eliminated entirely from hand-made crystal glass. The answer lies in just that very fact -that it is hand-made. No matter how deft the touch of the sensitive hand of crafts­men, it is impossible to eliminate small variations. They should not be regarded as defects. Glass is one of the most difficult materials with which to work, and even machine-made glassware cannot be absolutely perfect. When a person thoroughly understands the characteristics of really fine crystal glassware, he seeks the hallmarks of either Thos. 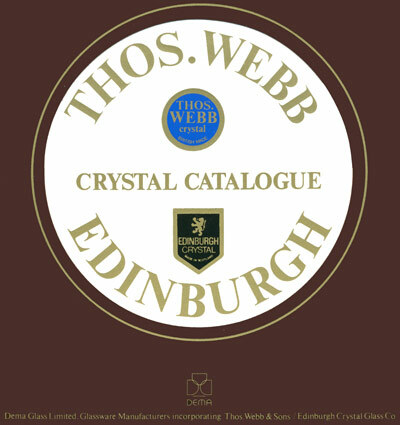 Webb or Edinburgh crystal. During the fusing and melting of the raw ingredients which form Lead Crystal, gases are evolved and air between the particles is entrapped. During the refining process nearly all these seeds or bubbles are removed. Small isolated ones sometimes remain and should not be regarded as flaws. When two pieces of crystal are joined together during the making of an article a small air bubble may be encased. Wherever possible, this inclusion is avoided, but in some cases it must be regarded as inherent in the product. Strange as it may sound, slight variations in dimensions are the hallmark of fine hand craftsmanship. Absolute uniformity can be achieved only in assembly-line products and it is not possible or even desirable, in quality ware, which depends so much on the skill and artistry of individual craftsmen. A customer may ask if hand-made glassware is really made by hand, or is it merely hand-finished? The production of hand-made glassware definitely is a hand process and requires the co-ordination of the skilled hands and eyes of many men, working in teams. It is a point of pride in the industry that variation between articles of the same shape and size is extremely small. When glass is perfectly homogeneous it does not contain cords. However, in practice, this state of absolute perfection is rarely achieved and slight differences in refractive index occur which are visible to the naked eye. Unless the effect is very pronounced it should not be regarded as a defect. These are sometimes apparent on the surface of the article and, if slight, should not be looked upon as imperfections. The marks will not in any way affect the longevity of service of the piece. The artisan frequently snips off excess glass when shaping the piece whilst molten. Slight marks from the shears can frequently be seen around the edge of handmade articles, and at the end of the handles of jugs. These marks are a normal characteristic of the glass and are not flaws. Tests by the British Glass Industry Research Association have shown that repeated washings in automatic machines with detergents or very hot water can destroy the surface of any glassware. It is recommended that glassware, and particularly lead crystal, should be washed by hand with warm water and soap or any suitable household detergent. Guided tours of each factory can be arranged on certain days. Dennis Glassworks, Stourbridge, West Midlands DY8 4EZ.